So there I was in Guatemala, where it’s cool to eat cookies before dawn. A murderer’s row of local and international scientists, conservationists, guides, tourism agents, optics ambassadors, and birding industry writers, editors, and organizers queued up, well before sunrise of course, for the short flight from Guatemala City to the Peten. Time in the terminal and during our brief puddle jump was sufficient for socializing; this crowd hit the ground optics blazing. Grackles and vultures and White-winged Doves were a cinch from the plane. Gray-breasted Martins danced overhead while Mangrove Swallows sunned themselves lazily on the runway like dogs on a summer afternoon. While waiting for baggage, ace birders scoped distant specks, picking out Groove-billed Anis, Eastern Meadowlarks, and even a caracara or two. Even during our sumptuous breakfast on the shore of Lake Peten-Itza, people couldn’t pull away from the Northern Jacanas and Purple Gallinules cavorting in the grassy marsh below. Trust me, you wouldn’t be able to either in an environment like this. Though our tiny prop planes disgorged a freight of neotropical birding specialists so sharp-eyed, sure-handed, and relentless in their unceasing surveys that a lesser biome might well have crumbled if not suffered total ecological collapse under its weight, the Peten was more than up to the challenge. My explorations of Cerro Alux and Finca El Pilar provided a thrilling education in the nature of Guatemala’s highland regions but the Peten is a different animal altogether. In these northern lowlands, one notes influences of the Yucatan and Atlantic seaboard suffused with the full flavor of the tropical rain forest. Heady stuff indeed. While the mountain forests of the central highlands presented a decent diversity of avian species, they are considered barren next to the profusion of wintering migrants, vagrants, and year-round residents of the Peten. 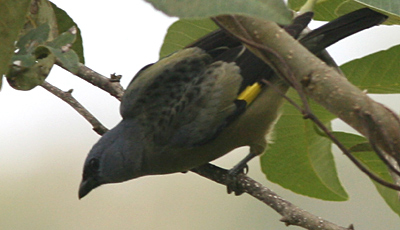 Of the 720 or so species reported in Guatemala, more than 400 of them appear in the northermost departmente. Have you gone insane yet? I did once we arrived at our lodging, the Hotel Villa Maya. Villa Maya is an impeccable ecolodge situated within a complex forest environment alongside a large lagoon, one which, I should add, harbors large (Morelet’s?) crocodiles. From the open-air check-in and dining to the breezeways, paths, and niches throughout, every aspect in harmony allows for a thoroughly tranquil and enjoyable stay. But I’m here to talk about the birds, which are, as you might have surmised, incredible in the truest sense of the word; I could scarcely believe the massive breadth and depth of species encountered over just a few hours here and there. As we approached, Olive-throated (or Aztec depending on your taxonomy) Parakeets and Acorn Woodpeckers flanked the road while a chorus of exotic calls filtered from the dense woods. Unexpectedly, as we crossed a shaded channel, many were treated to the sight of a Sungrebe, a highly coveted tropical species, fleeing for more private quarters. No sooner did we all check in than we plunged back into the jungle, immediately pulling crowd-pleasers like Black-headed and Violaceous Trogon, Red-billed Pigeon, Stripe-throated Hermit, Wood Thrush, and Red-legged Honeycreeper, each one a stunner in its own right. Speaking of stunners, A Collared Aracari, a toucan so visually arresting that it should be arrested, treated us to unforgettably long, lingering looks. This is what tropical birding is all about. With so many detectives on the scene, the grounds little by little yielded its secrets. A White-capped Mannakin here, a Keel-billed Toucan there, and soon everyone was worked into a lather. For example, Steve Howell, distinguished author of the epic A Guide to the Birds of Mexico and Northern Central America, spotted some Rufous-tailed Jacamar nests by the gatehouse. Anyone who knows how special this shy bird is will understand the alacrity with which many of us hit the trail; while I didn’t spy the jacamar here, we did run into Canivet’s Emerald and Wedge-tailed Hummingbird at the site along with Roadside Hawk, Tawny-crowned Greenlet, and Plain Xenops along the way. For the record, I have no idea what a xenops is supposed to be but that dainty, sharply upturned bill has boatloads of charm. The more secluded corners of the hotel grounds certainly promised elusive rarities (and perhaps an angry Fer-de-lance or two) but the feature that earns Villa Maya my imprimatur of Birding Paradise, no mean feat indeed, is how magnificent the birding is from the common areas. Splash around in the pool, stroll around the lake, or just hang out at the bar. It doesn’t matter what you do because the brightly colored songbirds are flying fast and furious. Social Flycatchers are easy to find in most settings, but here, they draw attention to trees dripping with Black-cowled, Baltimore, and Orchard Orioles, not to mention Yellow-winged Tanagers. 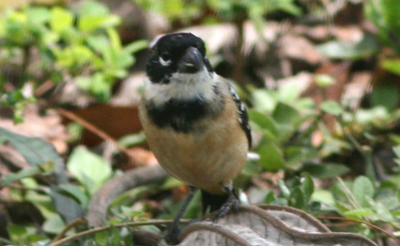 Walk two steps in one direction and you’ll spot White-collared Seedeaters and House Wrens. Go another and you might note Ringed Kingfisher, Snail Kite, or even Howler Monkey by the lagoon. The action is so rich, so variable and exposed that, in one quick break from a conference to stretch my legs, I picked up, without optics of any kind, a Yellow-breasted Warbler and Common Tody-Flycatcher in perfect plumage at eye level. I’m telling you, birds ham it up when a camera isn’t around! Perhaps I’m biased because Hotel Villa Maya seems home to large numbers of one of my favorite bird species. The only other time I’ve visted this part of the world was back in 2003 when Sara and I toured Tikal as well as the jungles of Belize. I recall one hot afternoon coming upon a small tree light on leaves but clustered thick with Blue-gray Tanagers lazing about like aquamarine mangos. The silvery complexion of Thraupis episcopus, so cool when most birds flash hot, earned this species a special place in my heart. Right next to it is now this ecolodge at which I was able to spy my beloved tanagers from the balcony of my room. Sipping stellar coffee on a warm, winter afternoon while Blue-gray Tanagers are joined by Yellow-throated Euphonias and a rotating series of brilliant songbirds as close as can be… how is that not paradise? I am now turning a deep shade of green with envy. I so long for a trip back to paradise and I can’t imagine how many life birds are available down there. It sounds like around 720 for those of us who have never birded the tropics! The hotel Villa Maya sounds like THE place to stay. I can almost smell the intoxicating mixture of rain forest and great Guatemalan cuisine. 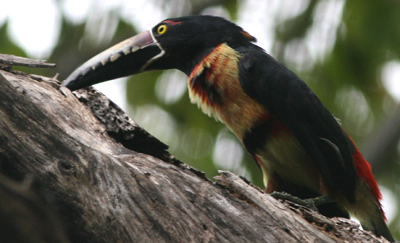 Thanks for the photo of the Collared Aracari. I don’t think I would be able to put my binoculars down long enough to eat a decent meal if I were viewing birds like that all day! Order me some huevos rancheros with black beans and some jugo de naranjas, I’m coming down! Hey!! this was great!! meeting you guys and sharing with all qualified birders like you!! Steve, without speaking for Charlie or Corey, I can’t deny that my life can be pretty sweet sometimes. This trip will definitely be one of the high points of an action-packed year. Larry, I appreciate your insightful comments. Villa Maya is indeed THE place to stay and I can’t wait to get back. In that part of the world, a birder only puts bins down for rest and refueling and huevos rancheros are essential. Seven of us went for lunch in Antigua and six ordered huevos rancheros. Ana, I feel the same way, although some of my colleagues might quibble with how “qualified” I am! When on a trip around Oct.8th 2006, involving being approx. 7,000-7,500′ up in the western Guatemalan Highlands surrounding Lago de Atitlan, we were brought by our guide to the head of a huge gorge. When taking a short hike uphill to photogragh some beautiful water-carved rock formations, I was captivated by a bird-song i have never heard the likes of. It was very long and complex, and hauntingly beautiful. I know it may sound extreme, but I felt it was the most beautiful natural sound i had ever heard. I asked my guide what it was, and he told me the natives in the area call them ‘Canyon Keepers’ and that they are only found in these deep gorges. Getting pictures of them are rare, as they stay mainly in the dark shadows of the gorges. I did get a picture of the one I could hear, as he was directly over my head, but it only got his profile against the backdrop of the sky above him. His body shape reminded me of a picture of a warbler I saw elsewhere on your site, and the size is about the size of a smaller robin.My guide told me that when you did see them, they were dark green with a gold chest. I also got a picture of what i though was probably it’s nest. I have seen smaller nests like these in the Pacific northwest, where I live. The ones I see here may go from 6-10″ in lenght as they hang down from branches. They appear to be soft and made up mostly of small twigs and moss. They sway in the wind. This one I got the picture of in Guatemala was possibly 12-18″ long. I just wonder if this bird is extremely rare, or if I just missed seeing any documentaries that have already included them. I have a hard time understanding why they would not be widely known with the unique and beautiful song that they have. Well, as you have probably guessed, i am no practised ‘birder’, yet I do enjoy nature in all its forms.Please let me know what you may know about these birds, and keep up the good work.